The wisdom of these ancient traditions share many common boundaries in their approach to enlightenment. In this article, Prahaladan Mandelkorn, a teacher of Yoga and Kabbalah, explores parallels between these two traditions. At the burning bush, Moses asked God to please tell His or Her name. “I am the I AM,” replies the Divine to each of us. “I am That.” Things just are what they are. Intrinsically, there is no why or wherefore. We make things good or bad, wise or foolish, tragic or glorious. We can’t help doing so, because by nature we are meaning-makers. Having recognized this aspect of our humanity, sages over the ages passed along to us some enriching meanings to put on our experiences of life. Shall we climb the Tree of Life to the Crown chakra, the Thousand-Petal Lotus? Shall we ascend through the worlds to atzilut, ego-less consciousness and wander in Brahman, the Absolute? As humans, our mystical experiences can be described with various languages and symbols that point to similar states of awareness as we consciously approach and awaken to absolute oneness. For many centuries, even millennia, Jewish and Christian mystics have used a Kabbalistic language to describe the same realms that Yogis experience at different chakras, or centers of consciousness. We say Isaac Newton discovered gravity, but gravity, of course was always there. By defining and naming it, however, he brought it into the foreground where we can measure and use it. These Yoga and Kabbalah images are simply language tools and symbols that may empower us. The 32 paths are ten infinite depths (sefirot) and 22 letter-numeral symbols that run between them, according to Kabbalah, which literally means, “Receiving” [a certain type of knowledge]. The seven major chakras referred to in Yoga are another way to distinguish these fields of consciousness. Kabbalah uses images, words and letter-symbols drawn from the Torah or Old Testament. The ascent of the kundalini, the powerful creative energy that rises through the chakras, is a Yoga language indicating the same realms. The base chakra, Muladhara in Yoga, where the kundalini goddess of serpentine power lies sleeping, is what the Kabbalists call Malkhut, the kingdom and majesty of God. It is none other than this very world we live in, and it’s blessed with a divine feminine presence, Shekhina, the presence of divinity in the here and now. “Behold me both as the one and the many,” teaches the Bhagavad Gita, “and wherever you look, you will see my face.” This is Malkhut. Among it’s many signs are the moon and the sea, grace, the Sabbath day, Jupiter, the bride of God, and the holy city entered by the holy king, and the promised land. As the spiritual seeker ascends, climbing the tree to the next sefira, the kundalini rises to the next chakra, swadhishthana in the reproductive area. In Kabbalah this infinite depth is called Yesod, the Foundation, Union or the Illumined Sage. Other signs of Yesod are maturity, wholeness, peace, the balanced self, the West, Saturn and the rectifier who sets straight the course. Above Yesod are Netzah and Hod, Victory and Glory, who in combination express the yang and yin aspects of the powerful navel chakra, Manipura. Think of the disciplined figure skater practicing again and again and again. That persevering strength is Netzakh—Victory. When she stands on the winner’s dais showered with honor and acclaim, that prakash or sparkling energy is Hod, Divine Glory. Anahata, the heart chakra, in Kabbalah is called Tiferet, the fullness of faith and the perfection of beauty, whose archetypes in the Hebrew cosmology are the illumined ones, Jacob and Hannah. For Christian devotees, Jesus and Mary are in the heart center; and in Hindu imagery it’s Krishna and Radha (or Ram and Sita). Other signs of Tiferet are the sun, the East, the perfection of humanity, Sri Ram, the Sun King, Atman personified (our higher Self, YisraEl), children, and the Elder giving blessings in the world. Who is really in the heart chakra? It is you and your beloved. Just above the heart are the infinite depths of Hesed and Gevurah, Compassion and Courage, who when combined may be experienced at the throat chakra, Vishuddha, which some Yogis say is the base of one’s will power. Kabbalists teach that Hesed is the infinite depth of loving kindness and mercy. Hesed has several other connotations: grace, bounteous love, the South, wisdom and gold. Gevurah is often expressed as awe, strength, judgment (karma), power, definition, silver, the North and wealth. “The awe we feel before the majesty and magnificence of this cosmos” writes Rabbi Art Green. This is Gevurah. These qualities are also describing refinements of awareness at different chakras, in this case, Vishuddha, near the base of the throat. Geographically and anatomically situated at the level of the eyebrows in the center of the head is the Ajna chakra combining the infinite depths of Hokhmah and Binah, Revelation and Comprehension. Hokhmah is also seen as primordial wisdom, the first utterance, the Omkar, Ganesha, and the beginning. It’s mate is Binah, contemplation and understanding. More than linear, rational thinking, Kabbalists use associative thinking. The ten sefirot are what Art Green calls “clusters of symbolic associations, the mention of any of which (whether in daily life, in speech or in text) automatically brings to mind all the others as well.” Examples of such symbolic associations in Binah are: a palace of light, the first temple; the quarry out of which the next seven sefirot and the 22 letter-symbols are hewn; the womb, our refuge, the place of return; t’shuvah—repentance, coming home; the upper Eden, paradise; the spring out of which the sacred rivers flow; our primal Mother; the jubilee, the 50th year, transcendence, and the festival of Pentecost. This type of associative thinking tends to enrich our experiences of daily life. If we come upon a spring in the field or the forest, for example, immediately we may think of returning to our source and refuge, the quarry, the mysterious 50, deep understanding, and being at the headwaters of the Ganges with the beloved. As we go through our day-to-day lives, these clusters of associations enhance our life experiences and refine our levels of awareness. We lean back in new wisdom, sometimes trembling in awe. For further inquiry, see: Ehyeh: Kabbalah for Tomorrow, Arthur Green, Jewish Lights Publications; SeferYetzirah: the Book of Creation in Theory and Practice, Aryeh Kaplan, Samuel Weiser Publishers; Kabbalah: Key to Your Inner Power, Elizabeth Clare Prophet, Summit University Press; Rabbi Shefa Gold: www.rabbishefagold.com; The Zohar, Book of Splendor, various translations; Sri Swami Sivananda, and Integral Yoga: The Yoga Sutras of Patanjali, Sri Swami Satchidananda, Integral Yoga Publications. Prahaladan Mandelkorn has been presenting “Torah and the Dharma” programs since 1975. 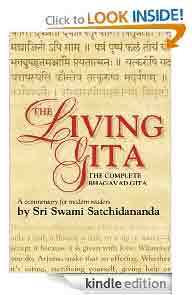 A senior student, he edited two of Swami Satchidananda’s books, To Know Your Self and The Living Gita. He collaborated with Rabbi Zalman Schacter-Shalomi on Fragments of a Future Scroll. Prahaldan served as director of Teacher Training at Yogaville. He teaches Bhagavad Gita classes, Jewish mysticism, and leads meditation workshops.